Reviews Coming at YA (*Kids Too*): Feuds by Avery Hastings—So fast paced the end sneaks up on you! Feuds by Avery Hastings—So fast paced the end sneaks up on you! 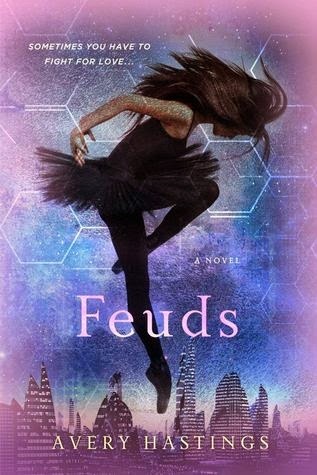 When I first saw the cover of Feuds, I was wary; I didn’t really want to read a book about a dancer. After the first chapter, however, I realized it wasn’t just about ballet; in fact, Davis is a sixteen year old living in a dystopian society where the rich, beautiful, and talented (the Priors) are segregated from the rest of the world, known as Geneserians (or in derogative terms, Imps). My first impulse at this point was to stop reading because I didn’t like the use of the name Prior after reading Divergent. I couldn’t stop picturing Tris every time Davis talked, but I tried to put that out of my mind and focus on the world according to Avery Hastings. Davis is one of the most talented priors alive. She is the daughter of a mother who competed in the Olympiads, and so she has a lot to accomplish. This is made easier for her by her genetics which were programmed before her birth. She is designed to be faster, stronger, and better than the Imperfects (“Imps”). All she has to do is stay focused and make it through the PA testing (physical aptitude) where she must prove her speed, strength, and improvisation through dance. Cole is a Geneserian who has to fight in a cage to make enough money to help his mother and survive. He takes a job for a lot of money where he must get close to Davis and take a picture with her, giving the current ruler a chance to crush Davis’s father’s contention for the upcoming election. An Imp seen with a Prior simply won’t be looked upon with much respect (very Romeo and Juliet, eh?). Once Cole meets Davis and realizes she is not the bad person she’s made out to be, he instantly falls for her. Now he must save her from her father’s campaign, the current ruler’s insistence on ruining her image, and Narxis, a genetic virus that is killing Priors. Despite the similarities to every rich girl/poor boy plot, the book really picks up about halfway through when Davis realizes she is in more trouble than she ever thought possible. There was a point where I couldn’t put the book down, and then suddenly I was at the end. Trying to reassure myself that my Kindle was malfunctioning, I reopened the book to realize that the book does end that quickly. I realize the book is set up to be a series, but the ending really snuck up on me, and I was a little disappointed by its brevity. I had begun to invest time and belief into Davis and Cole’s unlucky relationship, and then it just ended. While this does bode well for a sequel, it left me a little sour. As a teacher, this is easily paired with R and J or can be used in a dystopian book club. I think my students would enjoy it as much as I did.